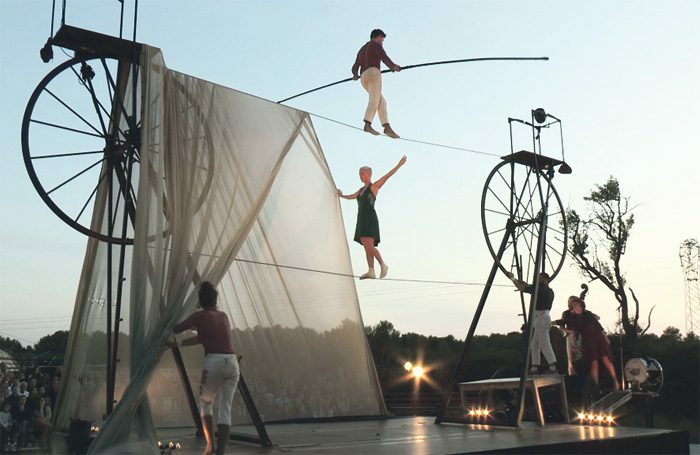 Whether on the Jurassic coast or at a hill fort, the outdoor element is integral to Inside Out Dorset – and it’s also proving a big draw for cutting-edge European collaborators to show West Country audiences what they can do. Organised by Dorchester-based Activate Performing Arts, the festival has been running since 2007 and brings urban and rural together with shows that are outdoors and mostly free (only one site this year is ticketed). It came out of a partnership between the county’s promoters and venues – many of them small-scale – who wanted to reach a new audience. The free events aim to attract people who might not ordinarily go into a theatre or gallery space. International partnerships are key to widening that appeal with a programme of mid-scale performance works and installations with strong performance elements. It’s a perfect match for companies from countries such as France, Belgium and Spain, which have access to a wide range of creation spaces in making outdoor arts and street theatre. Two UK premieres are Dutch: Waterlanders’ De Weide Wereld (Meadow World), an interactive installation about birdlife and the landscape, and Collectief Walden’s Olie (Oil), a show about how greed over natural resources affects nature. The latter has featured for several years at the Netherlands’ Oerol Festival, a major outdoor event that is one of Dorset’s main partners. Another partnership is Green Carpet, a commissioning network initiated by five European partners: Activate, Belgium’s Festival International des Arts de la Rue de Chassepierre and France’s Le Citron Jaune, Domaine de Chamarande and Cirque Jules Verne festivals. Representing Green Carpet is Les Souffleurs Commandos Poetiques, a French company whose Manimal (Heaume-Animal) is a non-verbal, site-responsive look at the intersection between animal and human worlds. The strength of those relationships also brings support from big players such as France’s Institut Francais and Netherlands’ Fonds Podiumkunsten, which – like Arts Council England’s funding for Dorset – are interested in ensuring that work takes place in the regions and isn’t centred on London.